Students! Click to book a group room. 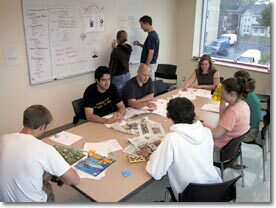 Group rooms are working offices for student teams. They are simply furnished, with a table, chairs, whiteboard and network connections. There are 40 group rooms; most accommodate 6 students; some will seat 10 or 12. An online booking system is available at kiosks in the IL Centre, or on the internet, for groups to reserve the rooms up to several weeks ahead of time. Group rooms may be booked by students for a wide range of activities, such as brainstorming, design discussions, preparation and presentation of reports, meetings with clients, and meetings with industry representatives and anyone else visiting the IL Centre. Outside the academic year they become workspaces for projects and outreach programs.